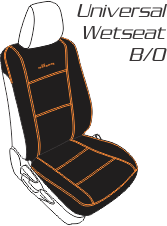 The Wetseat is Australia’s premier neoprene seat cover that is perfectly aligned with the way we live, by the sand, sea, mud, red dust and dirt. 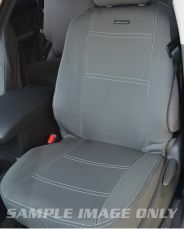 We cater for most Utes (new and older) Wagons, Sedans and even after market seats. Our range of neoprene covers are made from OEM (Automotive Standards) grade material, that is tested to many key standards relevant to Australian Conditions (and beyond) and are designed to fit like a second skin. All covers are made from a minimum of 2.7mm neoprene that's NOT foam filled, is latex FREE, and is UV & Water Resistant with a non-slip ribbed backing. Our range of tailored covers are 100% vehicle specific, emulating as much of the original seats panelling as possible, allowing for the full function of the seats including levers, lumber supports, fold out armrest, split folds, anchoring points, Side Seat Airbags plus much more. Our covers can be produced in Black, Mid Grey or Tan with top stitching available at no extra charge in Black, Blue, Charcoal, Orange, Red or in White. Alternatively, do you need something to throw on and off with ease? Then check out our innovative Universal Wetseat covers, designed for fitting onto bucket seats with removable headrests and to be compatible to Side Seat Airbags. This is achieved by way of not covering the airbag deployment zone. The Universal Wetseat open back cover is fitted in minutes and is very popular for those looking to protect the seats from occasional salt water and mud exposure, yet still providing excellent interior protection from less than $200! Are you still lookiing for more protection, then how about a console cover to match - we have these too for most popular makes and models.